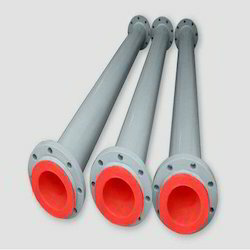 We are the pioneers in field of fluoro polymer lined pipes and fittings. All the lined products are manufactured as per the international standards only. Additionally, we also offer dimensional measurement and installation facilities as well at the client premises. Super Provides CS/MS/SS PTFE Lined Pipes from 25 NB TO 450 NB size. These are available in both jacketed and non jacketed versions as well. Additionally, our lined pipes are enginnered and mfg to work in both pressure and vacuum conditions. Super Provides CS/MS/SS PTFE Lined Pipes from 25 NB TO 450 NB Size. These are availbale in both jacketed and non jacketed versions as well. Super has own in-house Fabrication, Extrusion, Lining and Flaring department for manufacturing of CS PTFE Lined Pipes. The Pipe Material used is 106 Grade B Sch 40 from 25 NB to 150 NB and above Sch 20 Pipes are used. 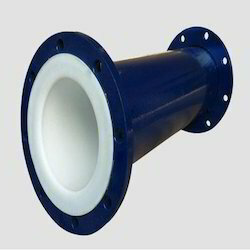 The Flanges normally used are of ASTM A 105/IS 2062. The raw material used is virgin grade. The pipe spools are lined with an interference fit paste extruded PTFE liner flared at each end to raised face dimensions giving all wetted parts in PTFE. Up to 6" NB the pipe spools use heavy duty PTFE liner suitable for vacuum performance. Above 6"NB we offer both heavy wall vacuum rated liners and standard wall liners as appropriate for the application. 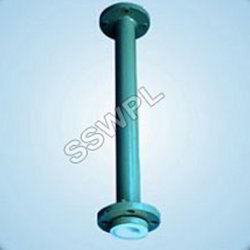 All CS/MS/SS PTFE Lined Pipes are tested as per the international standards ASTM F 1545 (2009) which includes Visual, Dimensional, Hydro Test and Spark Test. Driven with perfection, we are engaged in providing the customers with a commendable collection of CS PP Lined Pipes. Fabricated using advanced cutting edge technology, the range strictly complies with the predefined standards of the market. Widely appreciated for their efficiency, easy installation, corrosion resistance and longer service life, the range is widely used in diverse industrial applications. Super Provides CS PP Lined Pipes from 25 NB TO 300 NB Size. The Pipe Material used is 106 Grade B Sch 40 from 25 NB to 150 NB and above Sch 20 Pipes are used. Super Procures PP Liners Directly from Manufactures and do the PP Lining in Pipes. Abiding by the ethical norms & standards laid down by the industries, we have been able to provide the customers with an impeccable range of CS PTFE Jacketed Pipe. Manufactured using high grade raw material, advent tools and sophisticated technologies, our range is widely used in diverse industrial applications. The raw material used during the fabrication process is sourced from reputed vendors. 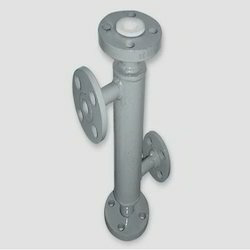 Offered in varied sizes & specifications, the range can also be customized as per the clients' requirements. Super Provides CS PTEF Lined Pipes from 25 NB TO 150 NB Size. We are manufacturing and supplying an optimum quality of Lined Pipes for our customers as per the need of them. We are supplying fix flanges and loose flanges on both sides of pipes. These pipes are manufactured by the optimum quality of raw material. We serve these products in various sizes and shapes. These pipes are working for a long time.